The cross-training (XT) hypothesis suggests that despite the principle of specificity of training, athletes may improve performance in one mode of exercise by training using another mode. To test this hypothesis we studied 30 well-trained individuals (10 men, 20 women) in a randomized longitudinal trail. Subjects were evaluated before and after 8 weeks of enhanced training (+10%/week), accomplished by adding either running (R) or swimming (XT) to baseline running, versus continued baseline running (C). Both R ( − 26.4s) and XT (− 13.2s) improved time trial (3.2 km) performance, whereas C did not (− 5.4s). There were no significant changes during treadmill running in maximum oxygen uptake (O2peak; − 0.2, − 6.0, and + 2.7%), steady state submaximal O2 at 2.68 m · s−1 ( − 1.2, − 3.3 and + 0.2 ml · kg−1 · min−1), velocity at O2peak (+0.05, +0.25 and +0.09 m · s−1) or accumulated O2 deficit (+ 11.2, − 6.1 and + 9.4%) in the R, XT or C groups, respectively. There was a significant increase in velocity associated with a blood lactate concentration of 4 mmol · l−1 in R but not in XT or C ( + 0.32, + 0.07 and + 0.08 m · s−1). There were significant changes in arm crank O2peak ( + 5%) and arm crank O2 at 4 mmol · l−1 ( + 6.4%) in XT. 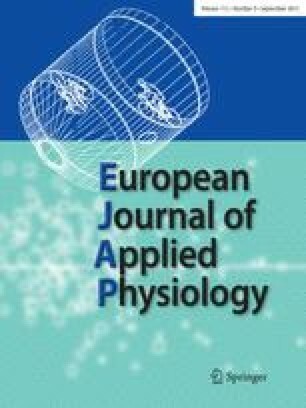 There was no significant changes in arm crank O2peak ( + 1.3 and − 7.7%) or arm crank O2 at 4 mmol · l−1 ( + 0.8 and + 0.4%) in R or C, respectively. The data suggest that muscularly non-similar XT may contribute to improved running performance but not to the same degree as increased specific tranining.